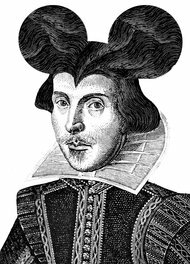 Disney has reportedly hired Tony-nominated director Alex Timbers to direct a movie musical version of one of William Shakespeare’s plays. Which one, we don’t know. Hamlet‘s been over done already. For the theater kids reading this, the stage musicals Timbers has directed include Bloody Bloody Andrew Jackson and The Pee-Wee Herman Show on Broadway, plus Disney’s Peter And The Starcatcher. Which Shakespeare play do YOU THINK IT IS?